Are you interested in Berlin? Berlin Wall ? Do you like to explore the city by luxury limousine, boat, bus or bike-taxi? Or are you eager to experience the scintillating nightlife of the German metropolis? Don't hesitate - contact us! If you are looking for culture, architecture, history, concerts, art, sport or an all inclusive package with a suitable accommodation. Then we can help you. Our website offers the best overview of Berlin's highlights, so you’re sure to find exactly what you’re looking for. 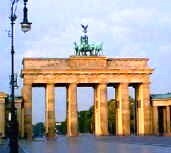 We provide taylor-made and personalized travel packages to Berlin in coordination with your special interests and will organize your group trip to the German capital competently, economically and individually.